Today’s Final Cut Pro X update adds features for both high-end professionals, those new to editing and everyone in between. Professionals can now stay in Final Cut for advanced colour correction and advanced media workflows. 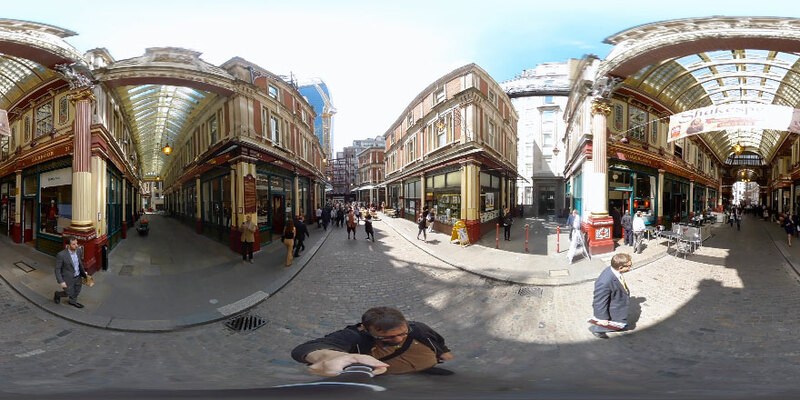 Everyone can explore 360° spherical video production – from those who have recently purchased consumer 360° cameras up to teams working on the most advanced VR video productions. 10.4 includes the ability to open iMovie for iOS projects for people who want move from free editing tools to a full video, TV and film production application. Apple has also updated Motion, their real-time motion graphics application, to version 5.3. Compressor, their video encoding and packaging application, has been updated to version 4.4. All updates are free for existing users, and prices for new users remain the same from the Mac App Store: $299.99 for Final Cut Pro and $49.99 for both Motion and Compressor. Apple have yet to introduce subscription pricing on their professional video applications. Those who bought them from the Mac App Store in 2011 have not had to pay for any updates over the last six years. The hardware requirements to run Apple’s professional video application remain the same, but a few features depend on them running on macOS 10.13 High Sierra: HEVC and HEIF support and attaching a VR headset. If you don’t yet need these features, Final Cut Pro, Motion and Compressor will run on macOS 10.12.4 or later. After I cover the new 360° spherical video features, I’ll give a rundown of the rest of the 10.4 update. The majority use phones looking at Facebook and YouTube videos to use a ‘magic window’ to turn around inside 360° – as they move the phone around in 3D space. The video displaying on the screen updates to match their position, giving the feeling of being ‘inside’ the video. Those that have bought devices worn on the head that cradle phones in front of their eyes as they look around (from less than $30). People with VR headsets ($200-$2000). Groups of people in rooms with devices that project the video on the inside of a dome. The rest of this section is a much shorter version of my Final Cut Pro & 360° spherical video: All you need to know page. 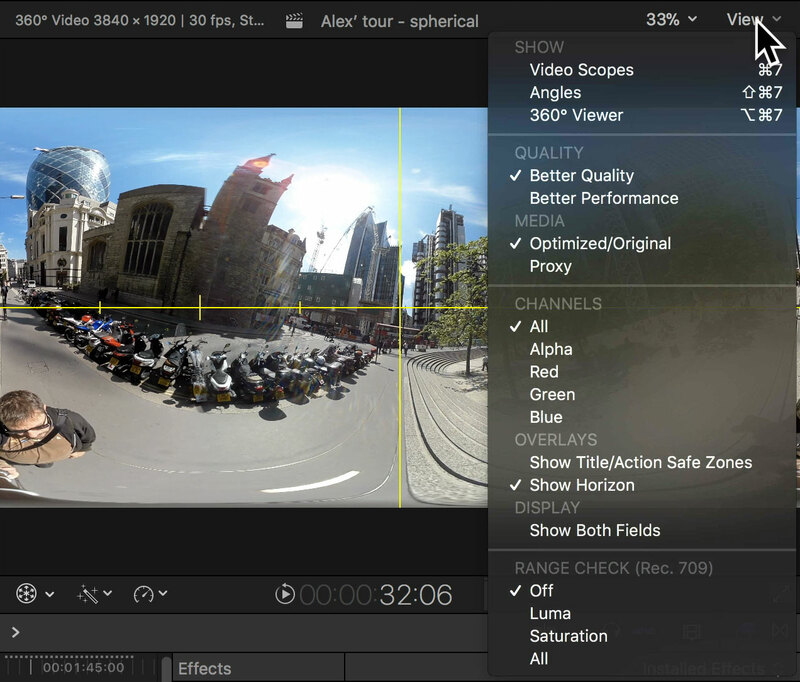 Final Cut Pro 10.4 can handle spherical video with ease. It recognises footage captured by 360° cameras and spherical rigs. 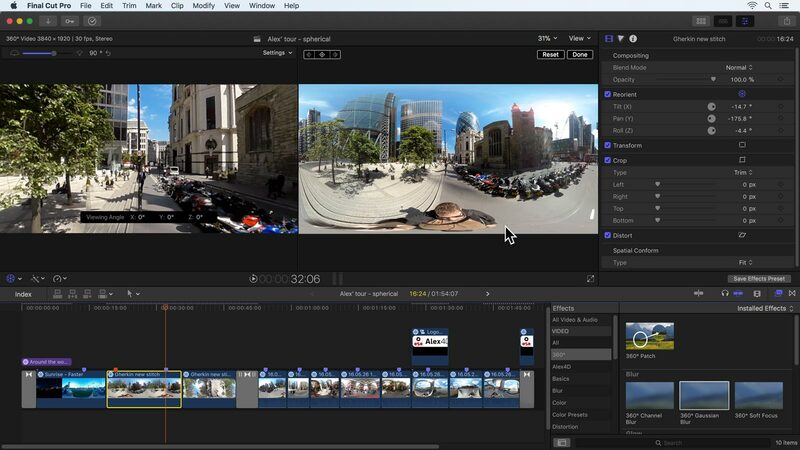 You can create spherical video timelines to edit 360° footage. 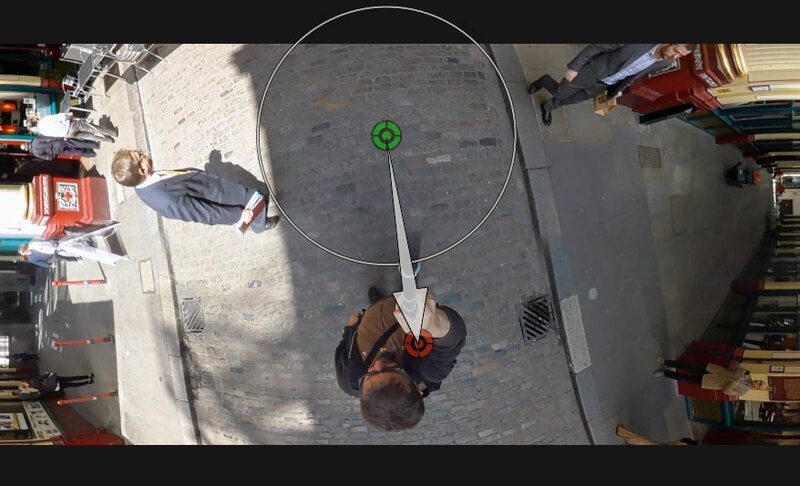 There’s a 360° Viewer in the Final Cut interface that can be shown next to the normal view that lets you get a feel of what your audience will see when they explore the sphere of video. To look around inside the video sphere, drag in the 360° Viewer. On faster Macs running macOS High Sierra you can install the Steam VR software and attach an HTC Vive VR headset to use it to watch the video play straight from the Final Cut Pro 10.4 and Motion 5.4 timelines. Apple’s technical support document on the subject: Use a VR headset with Final Cut Pro X and Motion. It has been possible to work with 360° spherical video in video applications before. As they are designed to work with video in rectangles – rectilinear video – it was necessary to ‘fool’ them into working with the spheres of video that are at the core of 360° editing. This was done with specialised 360° plugins, which were applied as effects and transitions to footage in rectilinear video timelines. Although the user knew that the rectilinear footage represented spheres of video, the editing and motion graphics applications had no idea. 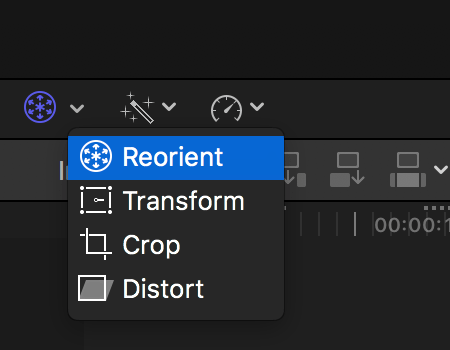 Apple have made spherical video a true peer of rectilinear video in Final Cut Pro 10.4 and Motion 5.4. If applications understand the nature of spherical video, existing features can be improved to do the right thing for 360° production, and new features can be added that benefit both rectilinear and spherical production. Media that represents spheres of video has ‘reorientation’ properties. This is useful when you want to choose which part of the sphere is is visible if the viewer is looking straight forward. When people start watching, playback starts with then facing forward. After initially looking around when the story starts, even though viewers can look anywhere in the sphere, most will spend the majority of the time looking forward, turning maybe 60° to the left or the right depending on video and audio cues. In 10.4 you can show a Horizon overlay which marks what is straight ahead, with tick marks to show what is 90° to the left and 90° to the right (the left and right edges of the rectangular viewer define what is seen if the viewer turns 180° from the front. There is a new Reorient transform tool for changing spherical video orientation by dragging in the viewer. This means that if the viewer is looking ahead when this shot starts, they’ll see the London bus. Final Cut Pro 10.4 doesn’t yet convert footage from 360° cameras and rigs into spherical videos. Apple expects that editors will use the specialised software that comes with cameras to do this work – which is known as ‘stitching.’ If footage needs more advanced work done on it (such as motion tracking to steady a shaky shot and removing objects from spherical scenes), that will need to be done in applications such as Mocha VR. 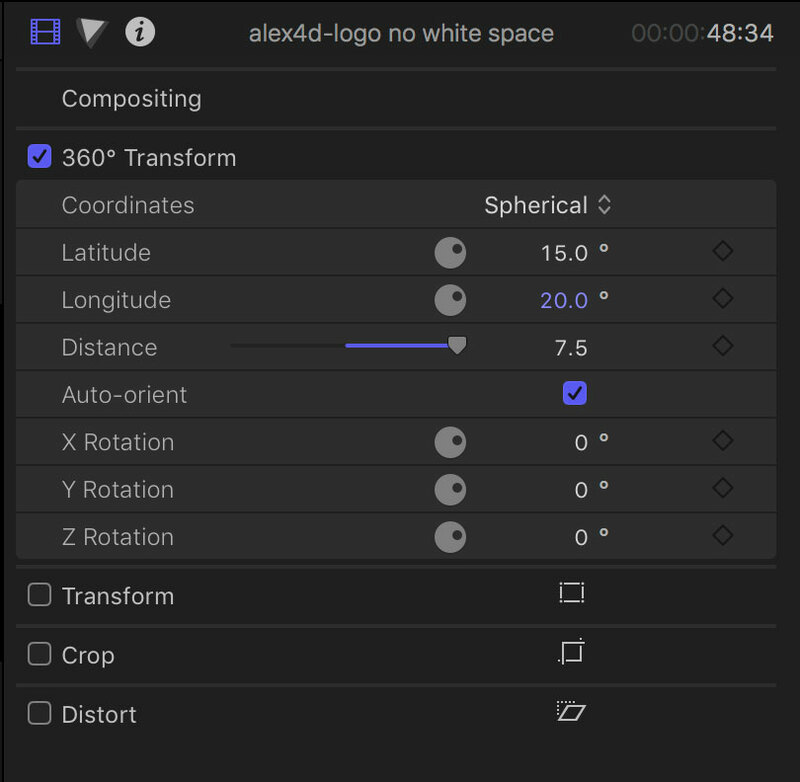 Final Cut recognises spherical media and knows how it should work in a spherical timeline. It also recognises flat media, and knows what to do with it in a spherical timeline. In traditional rectilinear projects, each piece of media has X and Y position properties. This allows editors to position footage and pictures in the frame. 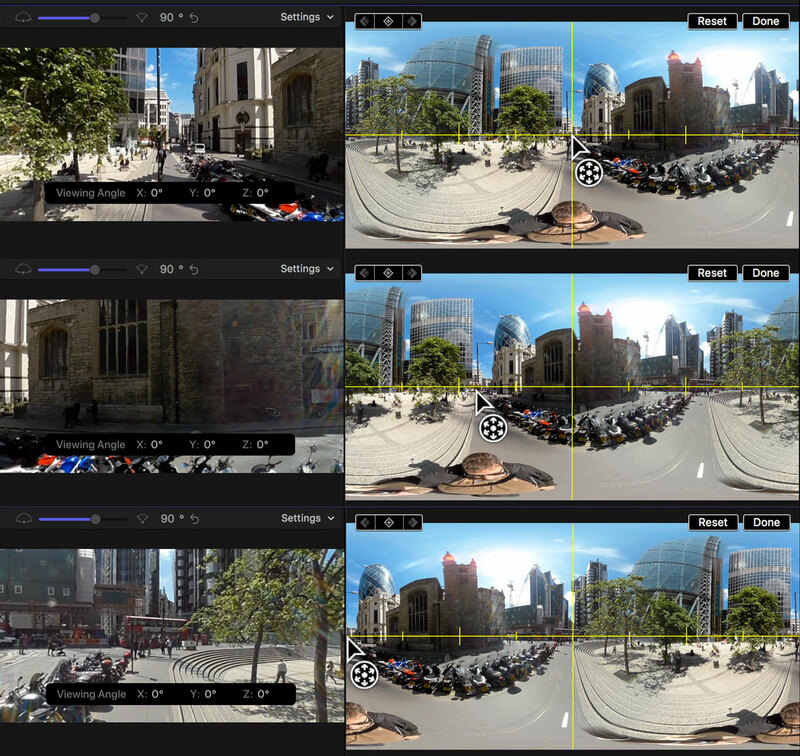 When flat (non-360°) media is added to a 360° spherical video project, instead of having X position, Y position and Scale properties in the ‘Transform’ panel of the clip inspector, there is an additional panel in the clip inspector: 360° Transform. This panel has properties that allow editors to position the flat media anywhere inside the video sphere. This can be defined in Spherical coordinates – two angles plus distance, or Cartesian coordinates – X, Y and Z co-ordinates (where the centre of the sphere is [0,0,0]). There is another plugin that can be used to hide parts of the sphere of video, which is useful when you need to hide the equipment (or person) that is holding the 360° camera. A tough list, but Apple are best positioned of anyone to be able to deliver these features to all Final Cut Pro users. The Apple video applications team can also bring 360° spherical video to millions of people through their other applications working on Apple hardware of all kinds: iMovie for macOS, iMovie for iOS, Clips for iOS and Memories for Photos. Choose which part of the footage to base a white balance on. A new option in the Color Balance effect (Option-Command-B). Apple help topic on manual white balance. New grading tools such as colour wheels, colour curves plus hue and saturation curves. Color Correction Overview. New built-in camera LUTs (including support for the December 2017 RED Workflow update and software from Canon) and support for loading more camera LUTs. 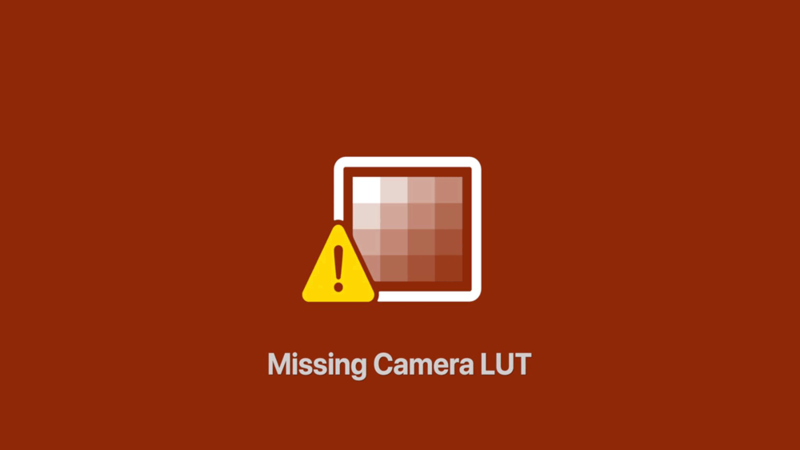 You can also control where in the pipeline LUTs are applied using the new Custom LUT effect. See Color Lookup Tables. All colour corrections can now be animated using keyframes. High-dynamic-range video allows the range of brightness levels in footage, projects and exports to be much larger. This means much more detail in brighter parts of the image. Wide Color Gamut and HDR Overview and Configure library and project settings for wide gamut HDR. There is a new button in the library inspector. 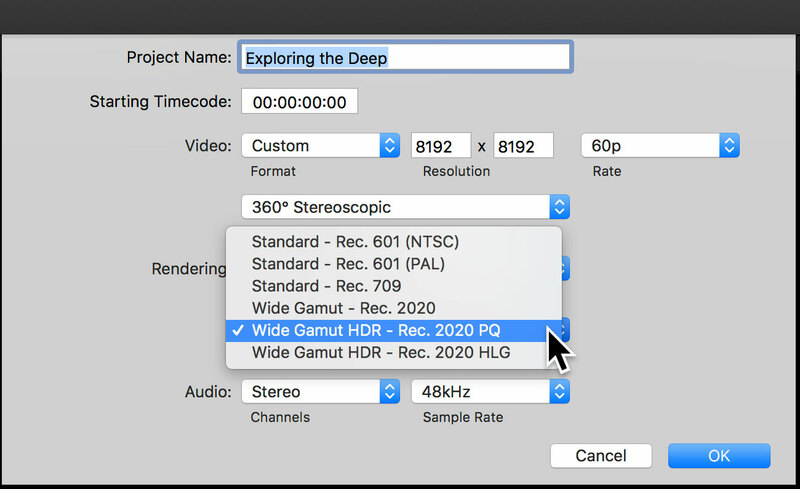 Once clicked you can set your library to be able to support media and projects with wide gamut HDR. As well as being able to HDR properties for footage, projects and libraries, there is a new HDR Tools effect to support standards conversion. 10.4 can also generate HDR master files. For a detailed article by someone much more expert than me on the subject of the new colour tools and HDR, read Marc Bach’s blog post. Any projects started on iMovie for iOS on an iPhone or iPad can be sent directly to Final Cut Pro 10.4 for finishing. Very useful for the many professional journalists who prepare reports on their mobile devices. See Import from iMovie for iOS. Final Cut Pro 10.4 libraries can be stored on connected NFS devices as if they were on local drives. Optical flow generation of new frames is now much faster as it has been rewritten to use Metal. The UIs have been redesigned and also been made resizable (using a 50%/75%/100% pop-up menu). 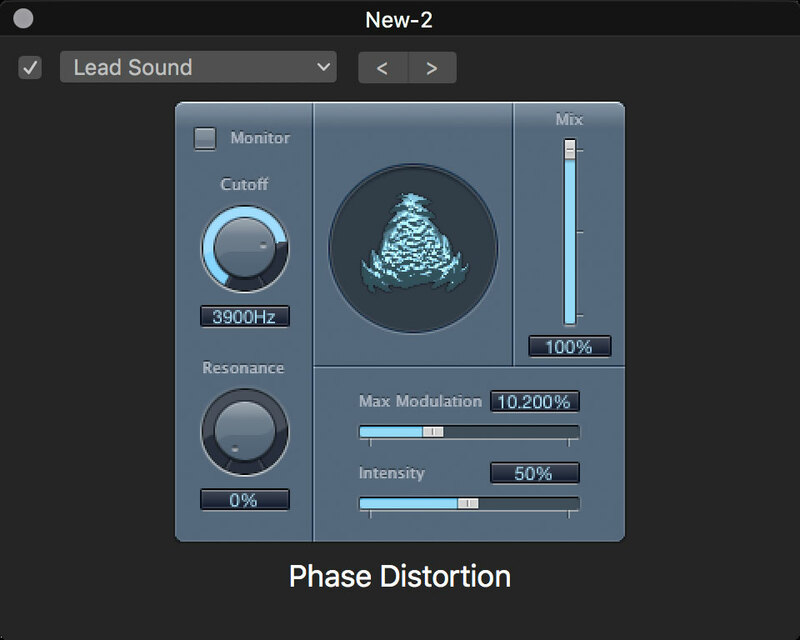 The Final Cut Pro X Logic Effects Reference site has been updated to provide help on the redesigned audio plugins. As this is a major update to Final Cut, the Library format has been updated to work with the new features. Apple advises that before you install the update from the Mac App Store, you should backup your current version of Final Cut and existing libraries. Before you update, check to see if you need to update your version of macOS. Final Cut will no longer run on macOS 10.11, but will still run on macOS 10.12.4. Apple’s detailed Final Cut Pro technical requirements. New in Preferences: In the Editing panel, you can choose which is the default colour correction that is applied when you click the Color Inspector icon in the inspector, or press Command-6. TIP: Control-click a clip in the browser to create a new project based on its dimensions and frame rate. 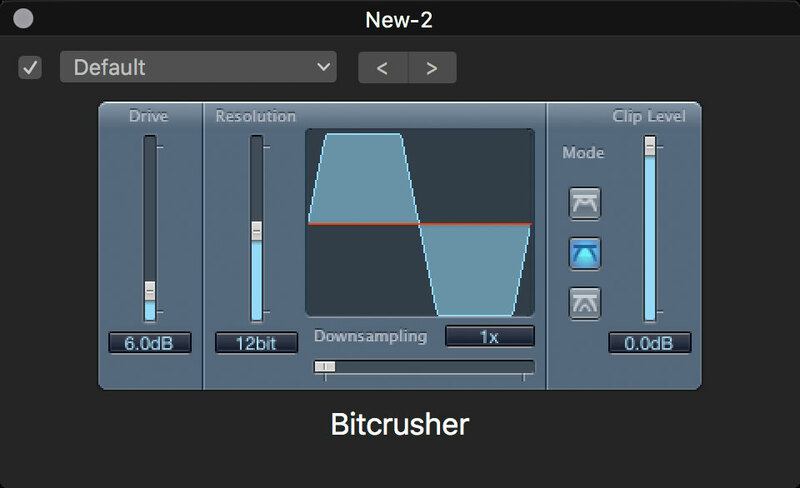 TIP: It is useful to be able to line up elements of waveforms when colour grading. To add a horizontal guide, click once anywhere in the waveform monitor. For new keyboard commands associated with 360° spherical video, visit my Final Cut Pro & 360° spherical video: All you need to know page. Apple ‘went back to 1.0’ with Final Cut Pro X in 2011. They didn’t push Final Cut Pro 7’s 1990s software core to breaking point to accommodate new digital workflows. They imaged what kind of editing application they would make if they weren’t limited by the ideas of the past. One result was that Final Cut Pro 10.0 was based around GPU rendering and multiple-core CPU processing. The kind of processing that 360° spherical video production needs. Following the Final Cut Pro 10.4 update, the Apple Video Applications team are now well placed to develop more of their products and services to support many more people who want to tell stories through 360° spherical video. For years now Final Cut Pro has been powerful enough to work on the biggest shows, yet friendly enough for the millions of people who know iMovie to make a small step towards professional production. With 10.4, that applies to 360° spherical video too. I’m looking forward to experience the stories they tell. New iMac Pro – How much better at 360º spherical video stitching?